The following module was designed to supplement medical students’ learning in the clinic. Please take the time to read through each section by clicking the headings below. Information on anatomy, epidemiology, prevention, pathophysiology, classification, diagnosis, staging, prognosis, treatment, and follow-up of melanoma is provided. Understand the general anatomy of the skin including the types of cells. Describe the stepwise progression of melanoma from dysplasia to invasive melanoma. Describe the current rate of melanoma and its trend. Identify the risk factors associated with melanoma. Describe characteristics associated with high risk UV light exposure. Identify the different types of nevi and their metastatic potential. Discuss the relevant genetic risk factors associated with the development of melanoma. Describe the tools used by healthcare professionals for determining the risk of melanoma. Demonstrate an understanding of skin cancer screening and the importance of diagnosing melanoma at an early stage. Be able to inform patients how to conduct a self-skin examination. Understand the role of UV light exposure in the pathophysiology of melanoma development. Be able to distinguish between the different types of UV light and its effect on skin. Understand how nevi can change into melanoma. Describe the four major types of invasive cutaneous melanoma . Identify the common characteristics of each of the four major types of invasive cutaneous melanoma. Describe rare types of melanoma. Understand the algorithm used to approach a diagnosis of melanoma. Describe the differential diagnosis of nevi. Describe the diagnostic aids used during physical examination. Describe the different tools used to visualize a skin lesion. Understand the role of biopsy in the diagnosis of melanoma. Understand the types of imaging used to diagnose melanoma. Describe the different tumor, nodal and metastatic stages in melanoma . Understand the Roman Numeral staging for melanoma and how it relates to the TNM stages. Describe the Breslow and Clark’s method for staging. Describe the factors related to the prognosis of an individual with melanoma. Understand the relationship between tumor depth and survival rates. Identify the common methods of treatment for each stage of melanoma. Understand the relationship between the type of disease and the treatment. The skin is divided into the epidermis and dermis. The epidermis has 3 types of cells – flat squamous cells at the surface, round basal cells under the squamous cells, and melanocytes in between the basal cells. Melanoma is a malignant tumour that starts in melanocytes (melanin-producing cells). Melanoma most often starts as a slow-growing superficial tumour in the epidermis. It may be localized in the epidermis for many years. This stage is known as the horizontal or “radial” growth phase. If a melanoma is found in this stage, it can almost always be cured by surgical excision alone. If the tumour invades deep into the dermis, they enter the “vertical” growth phase and have metastatic potential. Below is the stepwise progression from dysplasia to melanoma in situ to invasive malignant melanoma. As with all cancers, invasive melanomas can spread locally, lymphatically and hematogenously. UV radiation is the most important risk factor for developing all types of skin cancer. Although UVB radiation causes sunburn and more acute DNA damage than UVA, 10 to 100 times more UVA radiation reaches the earth’s surface so UVA radiation is also a major contributor to the development of melanoma (4). The following are UV radiation related risk factors. For more on UV light exposure, see non-melanoma skin cancer risk factors. Nevi are strong phenotypic markers of increased melanoma risk, especially if a patient has numerous nevi or has a family history of melanoma. Atypical nevi are benign acquired melanocytic neoplasms that have many similarities to neoplasms. They are potential precursors for melanoma. They are generally multiple shades of brown or red-brown, greater than 6 mm in diameter, irregular in shape, have a pebbly or centrally raised surface, and have an irregular border. Approximately 10% of melanomas are familial. 4 to 10% of melanoma patients have a family history of melanoma in a 1st degree relative. 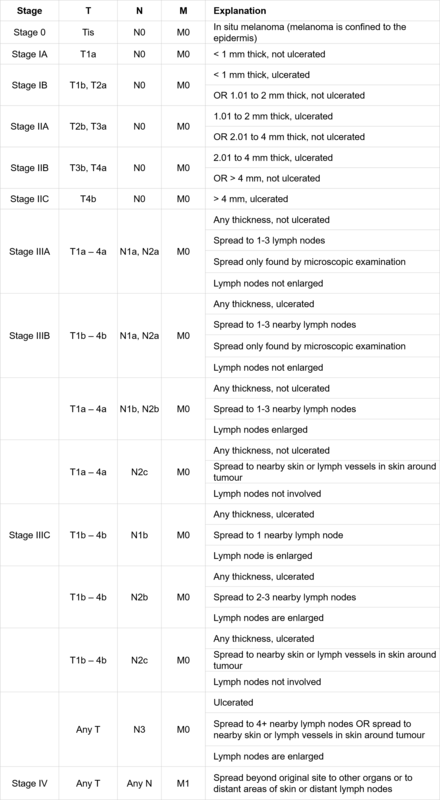 The major gene involved is the CDKN2A gene on Chromosome 9p (also known as the p16INK4A or MTS1 gene). FAMMM syndrome is characterized by 10-100 multiple melanocytic nevi mainly on the trunk, buttocks or lower limbs. It is inherited in an autosomal dominant fashion with incomplete penetrance. Xeroderma pigmentosum is a condition where skin cannot repair sun damage. DNA repair mechanisms are altered and thus skin is hypersensitive to UV radiation. It is inherited in an autosomal recessive fashion. Werner Syndrome is a rare condition characterized by the appearance of premature aging. In these individuals, skin ages prematurely and is at a higher risk of developing into melanoma. It is inherited in an autosomal recessive fashion. The survey assesses a patient’s awareness of typical and atypical nevi. It is to be completed before a clinical encounter. Screening refers to a short physical examination to identify suspicious lesions that require further evaluation. Screening of high risk patients is very important. High risk patients include those with family or personal history of melanoma, more than 10 atypical nevi, greater than 50 normal nevi, blistering sunburns in the first two decades of life, and older aged males with light hair colour. These high risk patients should be counselled on prevention and should undergo periodic dermatologic evaluation. Patient education is important for both early detection (detection during the radial growth phase) of melanoma and prevention of melanoma. Below is a list of patient education topics. Patients should be educated on wearing proper clothing and hats, avoiding direct sunlight, avoiding indoor tanning and wearing sunscreen. Skin Self Examinations are useful for tracking skin changes and can help identify melanoma in its early stages. A useful tool for skin self examinations is a body map, where patients can mark down all existing skin lesions on a drawing of a human body, and track the appearance of new lesions over time. High risk individuals should perform monthly skin self examinations. For more information on how to conduct a proper skin self examination, you can visit The American Academy of Dermatology’s website or The Skin Cancer Foundation’s website. To help patients identify a lesion of concern, the ABCDE diagnostic aid can be taught to patients. ABCDE stands for asymmetry, border irregularities, color variegation (different colours in the same region), diameter greater than 6 mm, and evolving. Evolving lesions may include lesions that become pruritic or begin to bleed, or may include lesions that change in colour, size or shape. Any lesions that develop above age 40 should also be considered seriously.Relevant inherited syndromesPatients with Familial Atypical Multiple Mole Melanoma (FAMMM syndrome) or other inherited syndromes should have a complete baseline examination and be monitored closely. They should be educated about seeing their dermatologist every 3 to 6 months for a total-body examination. They should also know to report any skin changes, so that pigmented lesions of concern can be excised or treated appropriately. The pathophysiology of melanoma follows the standard carcinogenesis model of tumor induction and tumor promotion. For example, UV light can be an inducer, but many promotion events, such as additional sunburns, are usually necessary before cancer develops. Promotion events are significant if they damage a cell rather than killing it, as killing the developing cancer cell would actually be more beneficial than causing replication of damaged DNA. UV light is below 400 nm in wavelength. It is the most important carcinogen in skin cancer development. UVC light encompasses wavelengths less than 290 nm, and is highly carcinogenic, but does not reach the Earth’s surface because it is blocked by the ozone layer. UVB light, which encompasses wavelengths 290 to 320 nm, is the next most carcinogenic. UVB light follows the melanin-independent pathway, which is associated with direct UVB-induced DNA damage that leads strand breaks and rapid formation of cyclobutane pyrimidine dimers which turn cytosine to thymine. UVB light is an important source of Vitamin D synthesis in the summer, but Vitamin D can also come from milk or oily fish. Year round Vitamin D supplements are advised in Canada. UVA light includes wavelengths 320 to 400 nm. The UVA light that contributes most to the development of melanoma is the light between 320 and 340 nm, which cause direct DNA damage. Wavelengths between 340 to 400 nm follows the pigment-dependent pathway, which through other activated photosenstiziers like reactive oxygen species, causes indirect damage to melanocytes and a slow (3+ hour) formation of cyclobutane pyrimidine dimers. UVA light is also responsible for tanning and wrinkling of the skin. 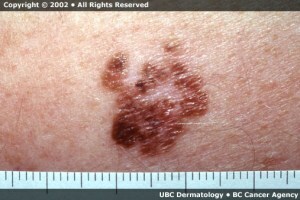 Melanomas can arise from damaged melanocytes. Damaged melanocytes may manifest as freckles, nevi, atypical nevi, or melanoma. Freckles are activated melanocytes, which produce increased numbers of melanin granules. Nevi are the result of melanocyte division. They can be junctional nevi, which appear at the epidermal-dermal junction, compound nevi, which occur in both the epidermis and dermis, or dermal nevi, which appear within the dermis. Nevi tend to begin as junctional in childhood and progress to become dermal. Once they get to the dermis, many undergo apoptosis.Typical nevi do not typically become melanoma, although a large number of nevi is associated with a higher risk of developing melanoma. Atypical nevi are nevi that have border and color irregularities. Border irregularities imply variations in growth rate of the cells in the nevus. Color irregularities imply variations in melanin production. An inherited trait called dysplastic nevus syndrome can cause a predisposition for more atypical nevi. Unlike typical nevi, they tend to remain flat and extend sideways instead of into the dermis. Atypical nevi may become a melanoma. There are 4 major subtypes of invasive cutaneous melanoma based on their histological differences. Most common subtype, about 65% of all malignant melanomas. Majority are de novo, while 25% are associated with a pre-existing nevus (such as a dysplastic or congenital nevus). Occurs at any age after puberty. Has a predilection for the back in men and lower extremities in women. Appears as a flat, variably pigmented plaque with an irregular border, a few mm to several cm in diameter. Often fits the ABCDE criteria for diagnosis. Usually undergoes a slow change over 1 to 5 years and becomes more irregular, asymmetric, varied in color, and depigmented over time. Starts with outward radial growth and spreads across the surface of the skin. Progresses to downward vertical growth. Histologically, appears poorly circumscribed, and lacks cellular maturation. Second most common type of melanoma, 15 to 30% of melanomas. Most difficult to diagnose at early stage. Often found on the chest, back, head or neck. Raised or dome shaped. Appears stuck to skin. Darkly pigmented (often black or blue in color but some are amelanotic/flesh-coloured), pedunculated (attached to the base tissue by a slender stalk) or polypoid nodule. Vertical growth phase melanomas (no identifiable radial growth phase). Grows more quickly than other types of melanomas and easily spreads if not removed. Histologically, dermal growth occurs in isolation or with epidermal component. Note: Lentigo maligna melanoma is not to be confused with lentigo maligna. Lentigo maligna melanoma is a type of true melanoma that arises from a lentigo maligna (a melanoma in situ that consists of malignant cells but is not invasive). Most often seen in sun damaged skin of older individuals, more common in women than men, commonly on the head and neck. Appears as large and flat lesions. Begins as a freckle like tan brown macule and gradually enlarges and develops dark asymmetric foci over time. Has irregular borders with notching and indentation. 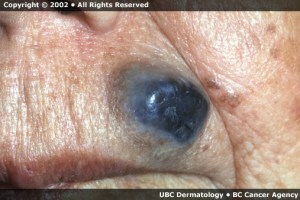 Transformation from intraepidermal lesions to lentigo maligna melanoma is slow. Histologically, neoplastic melanocytes are seen along the dermal-epidermal junction in a lentiginous pattern. Epidermal atrophy and solar elastosis is also seen. Rare. About 5% of melanomas in Caucasians, 35-60% of melanomas in African-Americans, Asians and Hispanics. Commonly on palmar, plantar (soles of feet), subungual (under the nails) and mucosal surfaces. Often looks like subungual hematoma or plantar hematoma. Dark brown to black unevenly pigmented patch. Foci of grey or white discoloration indicates areas of regression. Subungual melanomas present as a brown or black streak under the nail bed and may be misdiagnosed as hematoma. Like nodular melanoma, lesion may grow aggressively, changing quickly from radial to vertical growth. Histologically, lentiginous arrays of atypical melanocytes line the dermal epidermal junction and foci of confluent melanocytic growth area seen. Atypical cells are large and hyperchromatic angulated melanocytes with scant cytoplasm. Mucosal lentiginous melanoma: Rare type of melanoma that occurs in melanocytes that line respiratory, gastrointestinal and genitourinary tracts. Intraocular melanoma: Rare type of melanoma that occurs in the eye. The most important part of the clinical assessment for skin cancer is the physical examination. A total body skin examination (TBSE) should be done. While the patient is sitting up, the face, rest of head, neck, scalp, arms and hands are examined. The patient is then asked to lie down on his or her back and the chest, abdomen, anterior thighs, anterior legs, dorsal feet, soles and toe webs are examined. Finally, the patient is asked to turn over and the calves, posterior thighs, buttocks and back are examined. The lymph nodes near lesions should also be palpated. These features correlate with the most frequent clinical signs associated with melanoma. The ABCDE diagnostic aid can be used by clinicians as well as patients to inspect suspicious lesions. Note: For high risk individuals, monthly self-examinations should also be done. See section on Prevention. Dermoscopy, or Epiluminescence Microscopy (ELM), uses a dermatoscope (a handheld 10x lens microscope) or computerized digital imaging to visualize a lesion. Dermoscopy is a multistep process that determines whether a lesion is melanocytic, benign or suspicious. Melanocytic lesions are likely to have a pigment network (such as polygonal lines), globules/dots or streaks. It is rarely used in primary care and usage requires special training. Pathology is required to confirm diagnosis and help determine prognosis. Biopsies are done for suspicious or atypical lesions. Melanomas tend to be polyclonal and variable so placement of biopsy is very important. If there is variation in pigmentation, then more than 1 area should be sampled. If there is any portion of the tumour that is elevated or nodular, it should be sampled. Excisional biopsy, which includes removing normal tissue around the periphery of the lesion, is preferred over incisional biopsy, where only part of the lesion is removed. This is because excisional biopsy allows better histological examination and measurement of the lesion’s thickness. If excisional biopsy is not possible, then single or multiple incisional or punch biopsies may be used instead. Superficial shave biopsy is discouraged. Fine needle aspiration is not useful for primary lesion diagnosis but can be useful for metastatic assessment, such as in evaluation for metastasis in satellite skin nodules or regional lymph nodes. Sentinel Lymph Node Biopsy, or SLNB, is a technique used for staging patients with moderate risk melanoma (>1mm) and clinically negative lymph nodes. The sentinel (initial draining) node is identified using a dye and radioisotope, and removed for analysis. This is usually done at the same time as the surgery for the removal of the primary melanoma. SLNB is used to stage, help determine prognosis, as well as guide treatment of cancer. If patients are asymptomatic with localized melanoma, routine blood tests and imaging are usually not recommended. In general, imaging studies such as Chest X rays, CT, and PET have relatively high false-positive rates. Therefore, imaging should only be done for investigations of suspicious signs or symptoms that may influence clinical management. Lactate dehydrogenase indicates a worse prognosis if the cancer has metastasized. However, it is insensitive as a marker for metastatic disease and not usually clinically useful. Imaging can be done to assess the extent of the disease for higher risk lesions. Ultrasound can be used to monitor or check the lymph nodes for metastasis. CT can be used to image the lymph nodes, chest, lungs, liver, abdomen, pelvis and if MRI is not available, the brain as well. MRI can be used to assess potential metastasis to the brain or spinal cord. Patients often obtain a CT scan before an MRI is performed. PET can be used to evaluate metastases to lymph nodes or other organs for high risk melanomas. It is not done routinely. As with other tumours the TNM staging can be used. It is complex and the tables below are for reference. The TNM stages are combined to give an overall stage, from Stage I to Stage IV. The Breslow’s method stages tumors according to its thickness. The thickness of the tumour is measured in millimeters with an ocular micrometer, measured from the top of the tumour to the deepest cells. This thickness is used in TNM staging for melanoma. The Breslow method is the preferred method of microstaging, as it is the most accurate type of microstaging. The Clark’s Method Levels I to V are defined according to the depth of penetration into dermal layers and subcutaneous fat. It is less accurate than the Breslow’s method. Prognosis is dependent on many factors. Depth of invasion is the most important determinant of prognosis and depth of invasion and presence of ulceration is the best predictor of recurrence. Surgery is the main method of treatment. A local excision is made with a wide margin of normal skin to remove all possible malignant cells. Melanoma of the finger or toe sometimes requires amputation of the proximal digit. Below are the suggestions for the sizes of margins. There may be exceptions, as individual factors must also be considered. For example, patients may have surgical constraints or minimization of morbidity that play a role in the decision. Stage III most commonly presents as metastasis to a draining local lymph node basin, but may also present with a local recurrence at the edge of a scar or graft, as satellite metastases (separated from scar but still within 2-5 cm of scar), or as in-transit metastasis (>5 cm from the scar).Lymph nodes are dissected if a lymph node biopsy or fine needle aspiration biopsy has shown metastasis to lymph nodes, but a CT of the head, chest and pelvis has shown no obvious metastatic disease to distant organs. SLNB is a technique used for staging patients with moderate risk melanoma (>1mm) and clinically negative lymph nodes. The sentinel (initial draining) node is identified using a dye and radioisotope and removed for pathological analysis. This is usually done at the same time as the surgery to remove the melanoma, so staging and prognosis can be determined accurately. If the SLNB is negative, no lymphadenectomy is done and the patient is followed by a dermatologist. For larger palpable or SLNB positive nodes, the lymph nodes in the area are completely dissected, via a lymphadenectomy, and radiation therapy is performed. If the SLNB is positive, but “small bulk” (there is only 1 small lymph node), then systemic therapy should be discussed and the patient should be followed up with a medical oncologist. Stage IV disease often does not have a cure. Patients typically survive in the range of 6 to 15 months. Patients may be treated with systemic chemotherapy or may be treated palliatively. Systemic chemotherapy is an area of massive change. Some agents are targeted to specific genetic changes (e.g. 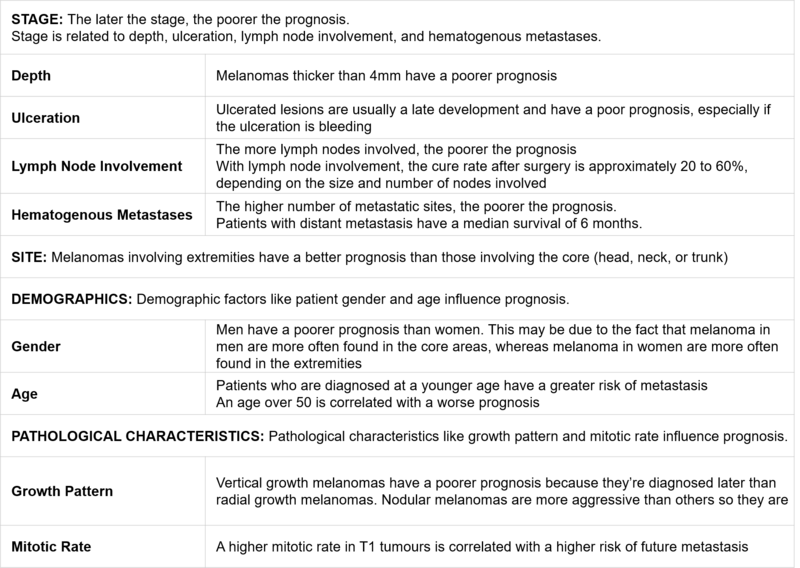 BRAF inhibitors) while others are directed towards the immune system. Below are just two examples of the many types of chemotherapeutic agents in use. Ipilimuab is a CTLA-4 monoclonal antibody used to induce anti-tumour activity. It is slow responding but long lasting. It acts against the CTLA-4 receptor on T lymphocytes and blocks the inhibitory signal that CTLA-4 produces when it interacts with its receptor. Therefore, T lymphocyte function is enhanced and tumour regression occurs in animal models. It is shown to improve overall survival. Targeted therapies such as those that target activating mutations in BRAF are a newer method of treatment. Palliative treatment is by far the most common treatment for metastatic melanoma. 1) Wiener C. Harrison's principles of internal medicine. New York: McGraw-Hill, Medical Pub. Division; 2008. 2) Shah A. Essentials of clinical oncology. 2nd ed. Vancouver, BC: Somerset Publishing; 2008. 4) Liu V, Mihm M. Pathology of malignant melanoma. Surgical Clinics of North America. 2003;83(1):31-60. 1) Canadian Cancer Society. Canadian Cancer Statistics. Toronto, ON: Canadian Cancer Society; 2015. 4) Autier P, Doré J, Eggermont A, Coebergh J. Epidemiological evidence that UVA radiation is involved in the genesis of cutaneous melanoma. Current Opinion in Oncology. 2011;23(2):189-196. 5) Gilchrest B. The Pathogenesis of Melanoma Induced by Ultraviolet Radiation. New England Journal of Medicine. 1999;341(10):766-767. 6) Cooke K, Fraser J. Migration and death from malignant melanoma. International Journal of Cancer. 1985;36(2):175-178. 7) Holman C, Armstrong B. Cutaneous malignant melanoma and indicators of total accumulated exposure to the sun: an analysis separating histogenetic types. Journal of the National Cancer Institute. 1984;73(1):75. 8) Colantonio S, Bracken M, Beecker J. The association of indoor tanning and melanoma in adults: Systematic review and meta-analysis. Journal of the American Academy of Dermatology. 2014;70(5):847-857.e18. 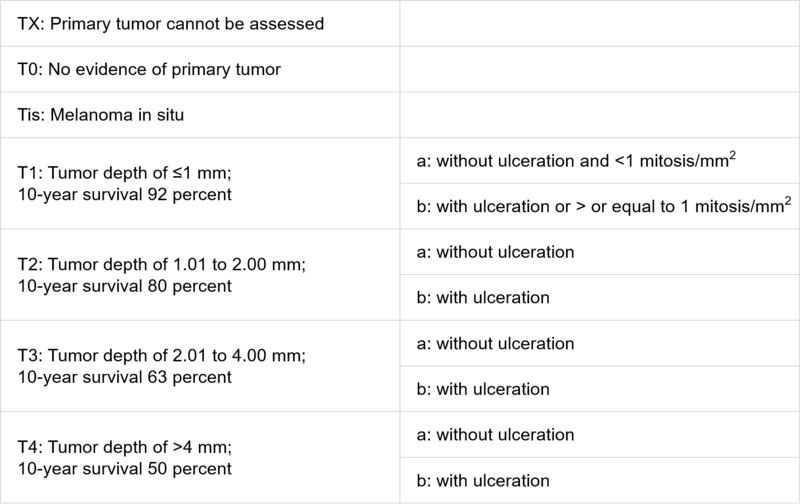 9) Stern R. The risk of melanoma in association with long-term exposure to PUVA. Journal of the American Academy of Dermatology. 2001;44(5):755-761. 11) Wiener C. Harrison’s principles of internal medicine. New York: McGraw-Hill, Medical Pub. Division; 2008. 1) Autier P, Doré J, Eggermont A, Coebergh J. Epidemiological evidence that UVA radiation is involved in the genesis of cutaneous melanoma. Current Opinion in Oncology. 2011;23(2):189-196. 3) Wiener C. Harrison's principles of internal medicine. New York: McGraw-Hill, Medical Pub. Division; 2008. 4) Shah A. Essentials of clinical oncology. 2nd ed. Vancouver, BC: Somerset Publishing; 2008. 1) Noonan F, Zaidi M, Wolnicka-Glubisz A, Anver M, Bahn J, Wielgus A et al. 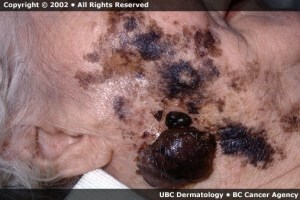 Melanoma induction by ultraviolet A but not ultraviolet B radiation requires melanin pigment. Nat Comms. 2012;3:884. 2) Premi S, Wallisch S, Mano C, Weiner A, Bacchiocchi A, Wakamatsu K et al. Chemiexcitation of melanin derivatives induces DNA photoproducts long after UV exposure. Science. 2015;347(6224):842-847. 3) Kalia S. Skin Cancer. Lecture presented at; 2014; UBC. 1) Shah A. Essentials of clinical oncology. 2nd ed. Vancouver, BC: Somerset Publishing; 2008. 2) Walter F, Prevost A, Vasconcelos J, Hall P, Burrows N, Morris H et al. Using the 7-point checklist as a diagnostic aid for pigmented skin lesions in general practice: a diagnostic validation study. British Journal of General Practice. 2013;63(610):345-353. 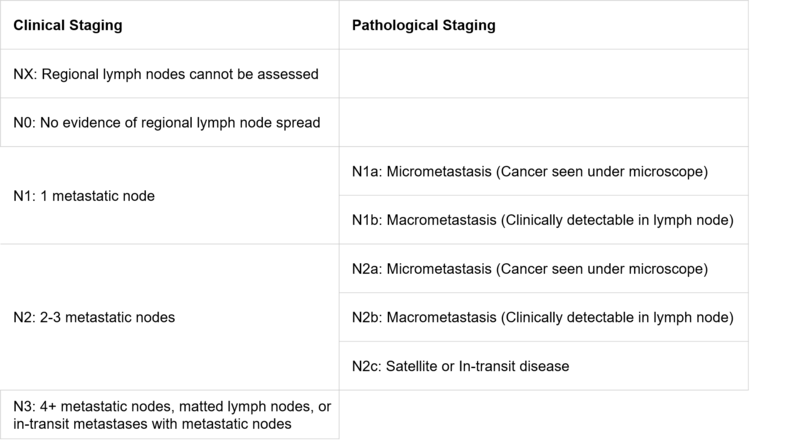 6) Kantarjian H, Koller C, Wolff R. The M.D. Anderson manual of medical oncology. New York: McGraw-Hill, Medical Pub. ; 2006. 2) Edge S. AJCC cancer staging handbook. New York: Springer; 2010.